Ariana Grande has been teasing “7 Rings” since the track name was a license plate in the “thank u, next” video. Now the song has album art, a release date, and a charmingly #richpeopleproblems backstory. According to Ari, the song is about the time Grande got drunk at Tiffany’s and bought her and her six besties matching engagement rings. After a bad day in New York, Ari’s buds took her to Truman Capote’s favorite jeweler. “”You know how when you’re waiting at Tiffany’s they give you lots of champagne?” she asked Billboard. Okay, let’s pretend we all know that. 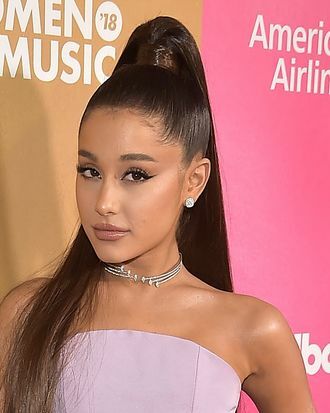 “They got us very tipsy, so we bought seven engagement rings, and when I got back to the studio I gave everybody a friendship ring.” On Twitter, Grande said there are actually nine rings (Lord of the Rings ref? ), because she also bought two for her mother and Nonna later. She also listed which friends got the bling. Champagne has apparently been one tool in Grande’s self-care arsenal, post-Davidson. “I am champagne,” she said. “You know how people say we’re 60 percent water? I’m 60 percent pink Veuve Clicquot.” The ode to friendship and drunken ring purchases drops January 18. Arianators have already begun preparations by adding ring emojis to their Twitter handles.